Fun With The Carbon Footprint Scam. Like the new avatar. I got me one of those 'flying ice cream cone thingys', too! Remember what 2 things fall from the sky? 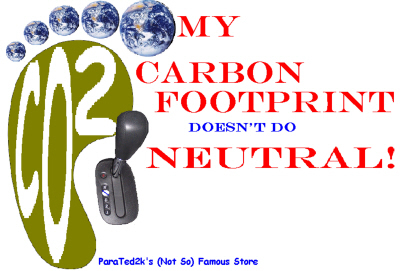 I do not have a carbon footprint. I just levitate over the ground, and even if I do not, I always wear shoes and if not I wear sandals. Does not the carbon footprint also mean you walk in your bare feet and make sure that you put then down in a coal bin? Or maybe they mean put it down on carbon paper. Have not seen any around -wait my checks have them, but my feet are way too big. Darn it! I guess I will have to leave the carbon footprint until later on! I dont know anything about my carbon footprint lol soooooo but love the humour!